The air intake manifold ensures the optimal filling of the engine cylinders with a suitable mass of comburent consisting of fresh air and recirculated exhaust gases. The intake manifold also carries out the function of integrating other engine supply control functions: fuel supply, fuel anti-evaporation system control, and engine operation point control. Hence, the air intake manifold can also carry out the function of engine supply mechatronic module, with the following advantages: compact size, cost, and assembly on the engine. The intake manifold basically consists of a volume of thermoplastic material with high thermal and mechanical resistance, hooked up to the engine by means of duly sized conduits and made in injection moulding technology and welding of vibrating parts. The technical solutions satisfy needs in terms of weight reduction and recyclable materials. Thanks to its knowledge of engines and experience when it comes to systems, Magneti Marelli Powertrain offers its customers, with delivery times compatible with the time-to-market, “turnkey” systems capable of meeting the following requirements: performance, fuel consumption and overall dimensions of engine vehicle applications from 2 to 12 cylinders. 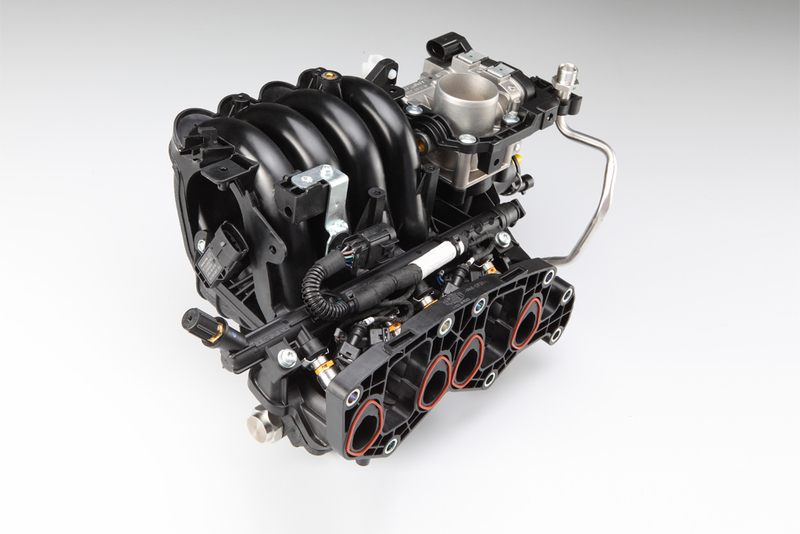 Through sophisticated virtual design techniques and advanced production technologies, Magneti Marelli can develop and manufacture complex intake manifolds equipped with electronic control systems of air and gas fluid dynamics aimed at maximizing performances, reducing fuel consumption and CO2 and reducing the noise emitted by the engine. The level of quality and reliability achieved by the Magneti Marelli intake manifolds is in line with the best-in-class of the sector. The overall production system allows the supply of the components to be localized near the customers’ production facilities, in Europe, Asia, North America and South America, with homogeneous qualitative and organizational standards suited to the needs of all carmakers.